Barrister Oluwole Oke (SAN), South West Zonal Director of the All Progressives Congress (APC) 2019 Presidential Campaign Council, said the people of the zone were not ready to lose the position of Vice President of Nigeria to South East. Oke, who stated this while speaking at a delegate conference organised for Buhari/ Osinbajo support groups in the South West at Mapo Hall, Ibadan on Monday. The APC 2019 Presidential Campaign Council Southwest Zonal Director noted that the region would benefit more by returning President Muhammadu Buhari and Vice President Yemi Osinbajo in the Saturday’s election. Oke declared that the conspiracy to take away the Vice President slot away from the South West and give it to South East would not work, appealing to the people of the region to vote massively for Buhari. He also urged members of the Buhari support groups to go and mobilise South West voters for the re-election of the President. He said, “We should retain the front seat we currently occupy in the national government. PDP wants to take away the Vice president slot from us and give it to the South East. We should not allow this to happen, and the only way we can ensure this is to vote massively for Buhari and Osinbajo. 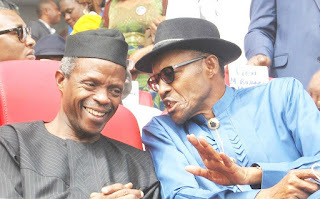 “Fortunately for us, we have about 16 million votes here in the South West, the South East in which PDP has zoned the Vice president slot to has only 9 million votes. Is it possible for the zone with 9 million votes to take away what belongs to a zone with 16 million votes?